Harry Casino is no longer available . Click here for alternative casinos . 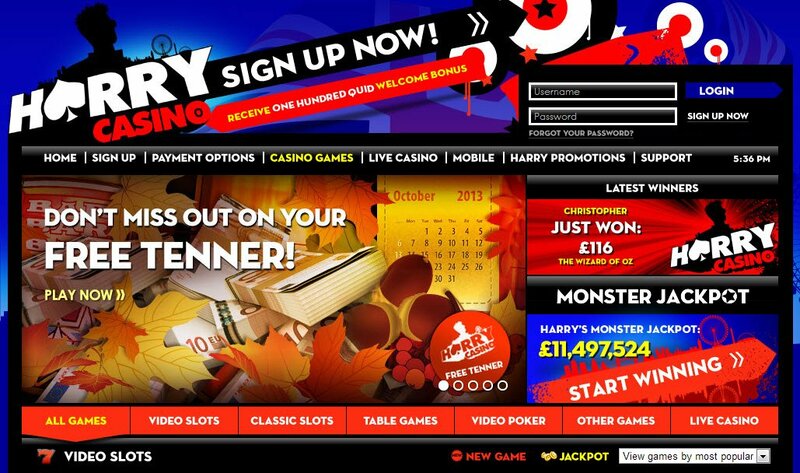 Harry Casino is a UK online casino, launched in November 2011 as part of the Betsson Group. The gambling site has since become Mr Smith Casino. They are licensed by Malta's Lotteries and Gaming Authority, and have, as they put it, one aim. 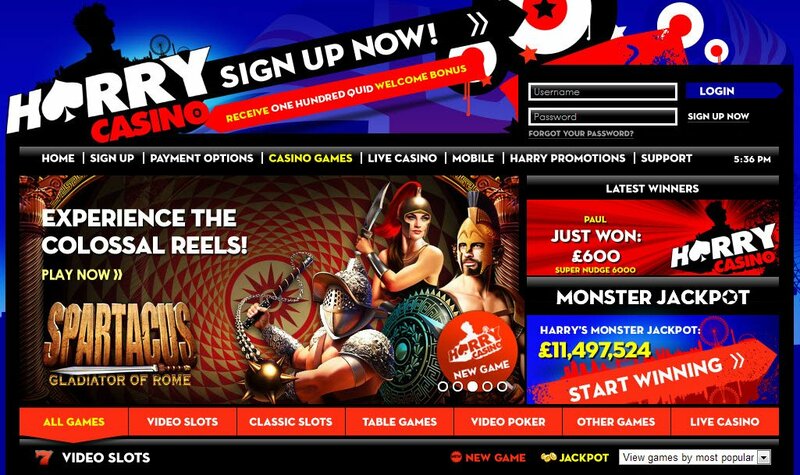 Their aim is to be the best British casino and give players the most fun and most thrilling casino games in the world. Harry Casino's Swedish parent company has a whopping 40 years' experience in the industry. 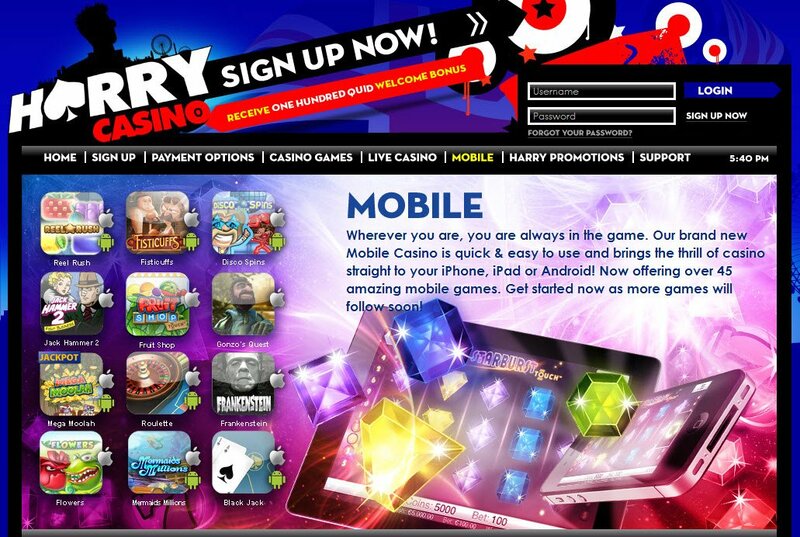 There's Harry Casino Live Casino and Harry Casino Mobile Casino for those of you who prefer to be mobile. Downloading Harry Casino is not an option. All their games are available to flash in your browser, after taking just a couple of moments to register at Harry Casino. There are most definitely two schools of thought on whether it is better to download an online casino, or play one in instant play in your browser. While most online casinos seem to opt for both options, some are decisive in their approach. Harry Casino takes the view that you can play all their classic slot games without having to wait for download. If the promotions and bonuses aren’t enough for you, just take a look at the mega cash up for grabs in all the Harry Casino tournaments and jackpot slots on offer. I was trying to add up how many different software providers Harry Casino used, but I almost ran out of fingers. One thing is for sure, Harry Casino players are going to get the best of all seven kingdoms. NetEnt offers the largest range of 5-reel and classic 3-reel slots at this online casino that is for sure. There are also contributions from Microgaming, IGT and WGS's most popular slots. What a Harry Casino bonus that is! I think there are even some Sheriff Gaming slots to be had in this online casino that makes me proud to be a British VegasMistress. The range of Harry Casino jackpot slots is phenomenal and makes me feel like I'm in with a real chance of winning, with so many lucky choices ahead of me. Harry Casino have also perfected their range of table games, with Blackjack, Roulette and all our favourite usual suspects, including variations on the usual playing methods available. Strap yourself in and get ready for a treat with Harry Casino bonuses and promotions. There's also no need to be scared of Harry Casino's monster bonus! Have your first deposit to Harry Casino doubled, 100% up to £100. Then there's the standard monthly bonus, 30% up to £30. There's also an elite monthly bonus, 50% up to £100, for the higher rollers amongst us. Get British and Refer Ya Mates, innit? Get special mates rates as a reward too, £20 for them and £40 for you. As standard, all major and lesser known payment methods are available to deposit to Harry Casino with. You cannot withdraw your winnings to all of them, but there is certainly enough choice available to make the transactions as smooth as possible. Customer Service was a real delight, my Live Chat was answered promptly, and I was given the chance to provide feedback after I had finished having all my questions answered. A sign that an online casino really cares about its customers I feel, and wants to continually improve. I was also emailed a whole transcription of the live chat, as soon as we'd finished up. Harry Casino Customer Support is available 24/7.